Time is passing quickly in Vienna as we have finally fallen into spring. I can’t believe it, but my time here is almost up. In less than a week’s time I will be leaving Vienna and beginning a new adventure. In the meantime, I have been doing my best to soak up Vienna and take in the sights and sounds I don’t want to miss. Life has been full with preparation for my impending departure as well as exploring Vienna and beyond. Here are some of the highlights! We visited the Donauturm as part of the celebration of the fair Anne Marie’s 7th birthday. In addition to a meal in a slowly rotating tower with panoramic views of the city, we got an unexpected bonus. It turns out they have bungee jumping from the tower. No… we didn’t go bungee jumping. Just watching people lean backwards and fall off the tower was enough excitement for me. Unbelievable. If you look closely at the photo on the right you can see a faint black line to the left of the tower. That is a bungee jumper dangling in mid-air after their descent. After completing their jump they were slowly lowered down to the ground. 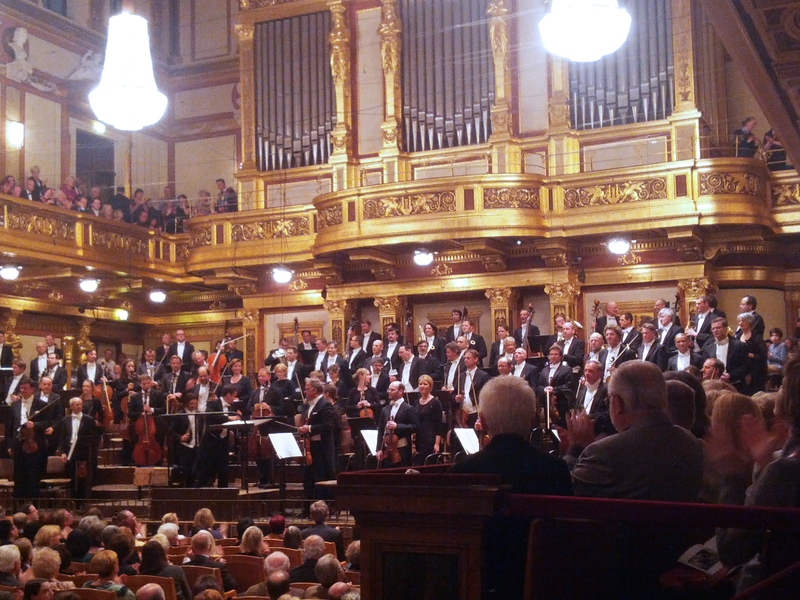 Upon the advice of my hostess, I headed to the Musikverein to see a classical Vienna concert, something not to be missed in Vienna. As tickets sold out quickly, I was only able to purchase a general admission ticket. I arrived a bit early to see if I could buy a better ticket informally outside of the concert house. Lucky for me a kind older man had an extra ticket as his wife couldn’t attend. He was an Austrian man who was generous with introducing me to the culture and tradition of the Musikverein. Our seats were quite good even though we were a bit clumsily arranged in a tiny space, shuffling our seats this way and that way to fit comfortably. My “ticket salesman” and host for the evening said, “Austrians may not be the most organized but we have a lot of heart.” And indeed they do. We continued to watch the passionate concert featuring the music of Richard Strauss and Franz Schubert. It was almost ten years ago that I discovered the Art of Living. An international spiritual and humanitarian organization, they made their way to New Orleans not long after Hurricane Katrina. Their intent, led by Indian guru Sri Sri Ravi Shankar, is to teach practical techniques to assist with managing stress and emotion. Over the years I have found their techniques helpful and the organization and leader filled with nothing but integrity. I simply couldn’t pass up an opportunity to attend one of their pillar courses, the Art of Silence, held at their European Center in Bad Antogast, Germany. Getting there (and back) was a windy tour through many of Germany’s train stations. The lengthy but leisurely train journey was certainly worth the while. Nestled in the hills of the Black Forest, the Art of Living Ashram was the perfect location for my 5 day dive into the Art of Silence Retreat which included a 2.5 day period of silence. With 25 other participants from an international array of countries, it was indeed a juicy journey. The experience has left me altered in a deep way and connected with something within me that is unexpected and cannot be replaced. It was one of the most profound, insightful and healing experiences I have ever had. I have a renewed spirit for my daily spiritual practices and a new set of tools to assist me on this continued journey of being human. The founder of the Art of Living, Sri Sri Ravi Shankar, made a one day appearance at the Ashram during the course. An internationally respected spiritual leader who attracts audiences of 1000s, it was quite an opportunity to connect in a more private and intimate setting. Just being in his presence felt like a gift and celebrating in a community with him was nothing less than pure joy. 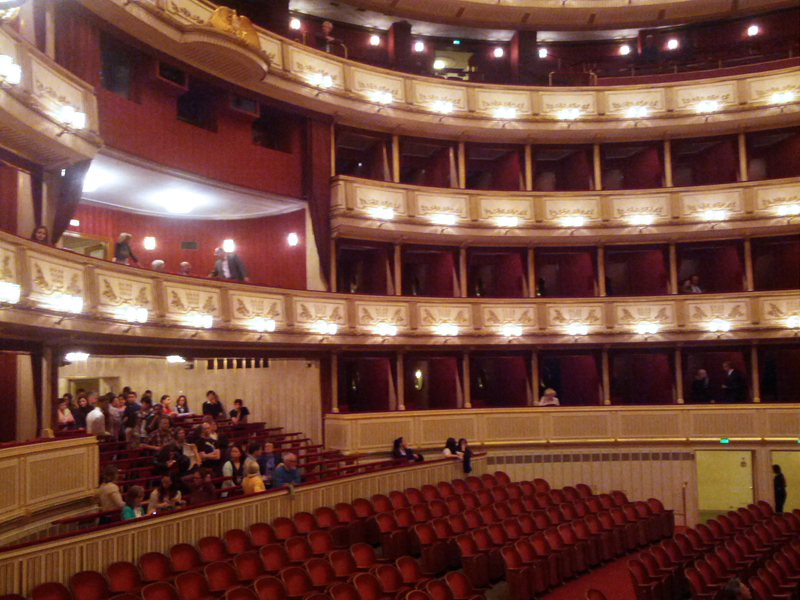 I didn’t want to leave Vienna without going to the Opera. I have never been before and it was an experience in Vienna I didn’t want to miss. And now I have seen an Opera… well, mostly seen one. It was the Friday night performance of Madame Butterfly and all tickets were sold out. 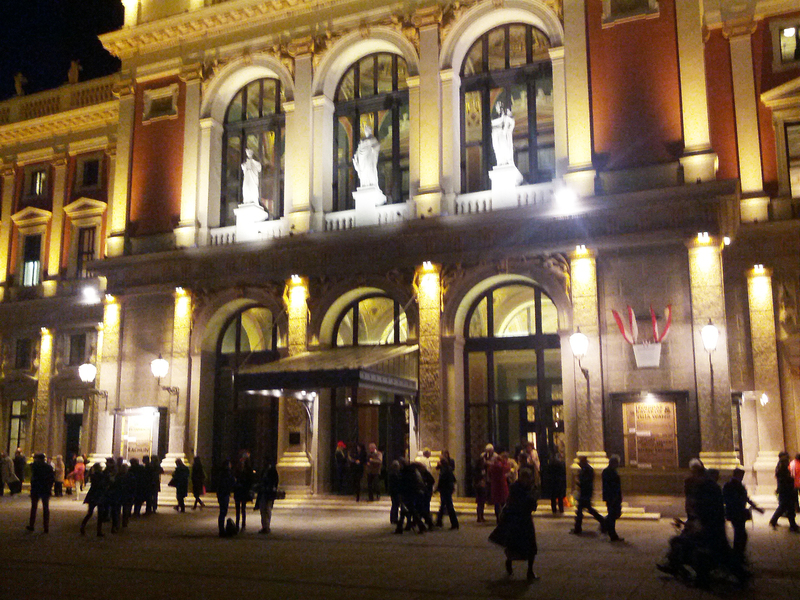 I went to the Opera House on the chance that I could buy a ticket on the street before the performance. I found an eager if not slightly crafty group of gentlemen selling tickets outside the entrance. I took a leap and bought a ticket from them and found my way in. I was relieved at least the ticket got me in the door without anyone batting an eye. I was disappointed in part when I was led to my seat. The location was great, the second level not far from the stage. The problem lie in the position of my seat. I was in one of the small rooms that encircled the opera house. It was filled with 6 seats, all quiet good except, unfortunately… my seat. From sitting relaxed in my chair I could only see 3/4 of the stage at best. How frustrating! But in truth I took a risk in buying the ticket and the costs was not that expensive. So, all in all, I was happy to be inside watching instead of not. Throughout the performance, if I leaned to the left… and on occasion stood up and leaned far to the right I could catch most of what was going on. Not quite the relaxing trip to the opera I was hoping for. But still the beauty of the opera, the music and the opera house itself were well worth the visit. Unforgettable. And so, for now, I remain in Vienna grateful for a few more days here, but earnestly preparing for my next stop. And while I am not yet going to share my next destination, it won’t be long before you will be hearing from me from my new location. Bye for now from the warm spring days in Vienna as I prepare for a new adventure. It’s kind of surprising to me… one of the things that I have enjoyed the most these past few years of travel and new experiences is… food! As you may have noticed, I have been a super-budget traveler as I’ve made my way in Europe and now South Korea. While I enjoy restaurants and eating out, they haven’t been at the top of my mission. My true pleasure has been connecting with and making my own meals, on occasion growing and harvesting the food, and often sharing it with other people. Don’t get me wrong, when it comes to cooking I am still learning the basics. I keep it simple and take it “one step at a time”. But in general for me, it has been and continues to be a joy. Who knew? When I was in Germany in 2011-2012 living at the Seminar Haus in Wettenbostel I often helped out in the busy weekend kitchen as my host there prepared food for the visiting guests. My tasks were usually simple ones – fry the onions in some butter, saute the mushrooms in balsamic vinegar (be sure to add plenty of garlic), chop the vegetables and make a salad. On a good day I was asked to make the salad dressing or perhaps some humus. During the week I would often prepare lunch for myself and the other staff around. It was usually something simple like a stir fry using whatever food was left on hand. Somewhere along the way, watching my host cook, helping him out often on weekends, doing my best not to cut off my finger as I chopped vegetables, and cooking some myself during the week… my confidence in and appreciation of cooking began to increase. When I left Europe a year and a half later and returned to the States to prepare my visa to teach in South Korea, I stayed with a family in the northeast for three months. I did a work exchange with them through the website helpx.net. The general idea is I do work for them in exchange for room and board. Initially my new hosts asked me if I cooked. I shied away from the question as I was hesitant to proclaim with confidence that I could cook a meal for them. Soon after I arrived, there was a busy day, no dinner yet and they needed me to cook the family meal. I have to admit I was nervous. I don’t remember what I made, but it was something simple. The good news was they loved it! My confidence in the kitchen continued to grow and it became my mission to prepare the evening family meal. I soon became the regular weekly shopper at their local co-op grocery, Weavers Way, and shopped with the intent of preparing healthy, affordable meals for their family. A new role for me. Now that I am in South Korea the meal table looks a little different. I am on my own without a “community” or family to feed. My “kitchen” is a tiny countertop that came equipped with a sink, some cabinets, a refrigerator and a hot plate. My kitchen table is my desk. As I am very sensitive to refined sugar, I can’t easily eat out in S. Korea. Koreans love to add sugar to nearly EVERYTHING. And so, the mission continues to make good healthy food… now in a new setting. After three months, my kitchen has a few added appliances – a rice cooker, a crock pot, and most recently a toaster/convection oven. I am surprised at the pleasure I get with each new addition. The excitement of cooking my first batch of rice in the rice cooker, so easily with just the touch of a button. Then discovering the many exciting things the rice cooker can do – like cook quinoa, oatmeal, and even polenta! Within the limits of my modest living space, it is still my pleasure to prepare meals for myself, search for recipes and try new things. My latest discovery in South Korea is Veggie Hill. It is a wonderful web-based business (www.veggiehill.org) that sources organically grown food from an area in S. Korea called Dumulmeori. All of the food they source is grown chemical free in soil that is high in nutrients. Keep in mind that in Korea there is no Whole Foods down the street and most grocery stores have very few if any organic items. Veggie Hill to the rescue! Their website is in English (hooray!) and it’s easy to order and then have your food delivered to your door. They even have food items like chicken and eggs! I ordered from them for the first time last week and recently received my order. Their prices are comparable to regular grocery store items and the produce looks so much better its unbelievable. I unpacked my lovely groceries this week and when I opened my refrigerator door I felt a sigh of relief. My refrigerator is filled with fresh, lovely food that looks, feels and tastes good. How wonderful! Some of my most recent meals this week have included preparing a whole chicken in the crock pot then making my own chicken broth and crock pot lentils accented with Indian spices served over rice. I track the recipes I have tried or want to try on my Pinterest board “Healthy Eating“. So it seems on this journey and in my life there is a time for all things. There is a time to laugh and a time to cry. A time to work and a time to play. 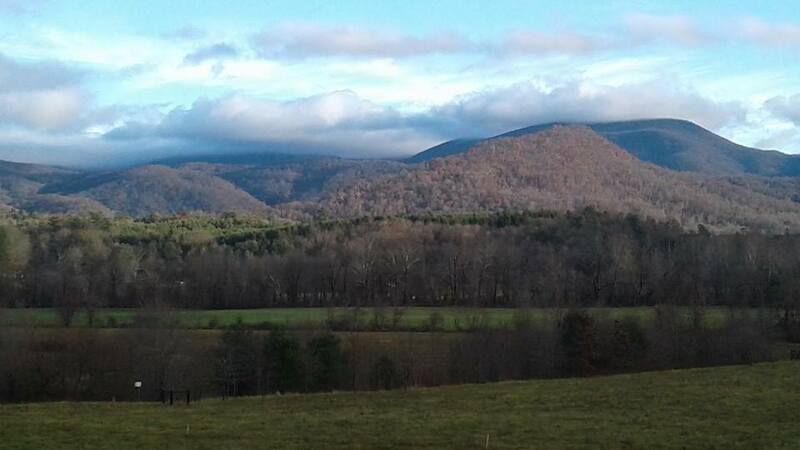 A time to be still and a time to wander…. and, yes, newly to me… there is a time to cook. How about you, what time or season is it in your life? Any interesting flavors or new experiences to share? Bye for now from the not yet Spring, “still a little chilly for my taste” land of Paju, South Korea! Top image is a sampling of the fresh fruits sand veggies I received this past week from Veggie Hill. It is around 7pm on a school night. I can hear the kids outside up to some sort of mischief with neighborhood friends. I am seeking a bit of refuge up in my room on the third floor. The chaos of full on busy family life has its interesting spins and for me, sometimes, it is exhausting. I have to laugh as I find one of my primary roles here is the evening meal cook, a job I scarcely thought myself capable of holding. But it seems that I am doing okay. After spending 8 months in the busy but capable kitchens of the Seminar Haus in Germany and four months mostly a witness to the beautiful meal preparation of the kitchens of Les Battees in France, it seems, to some degree, I can cook. This is a revelation for me. Tonight as I was preparing dinner the oldest son, 7, said to me a bit sheepishly, “I have to say, I don’t know what recipes you’re using but… you sure are a good cook.” From the mouths of babes. No better compliment. I am still finding my way a bit in this home…. As a “helpxer“, or living with folks in exchange for room and board, I find there is an ebb and flow to each new experience and my job is to learn to ride the wave. I have found you can try to set parameters, do you best to set some boundaries, but in the end the experience is its own creature. Here in this home in Philadelphia I am still exploring how to make the most of my trade in service to them in balance with my own independence. Some days I feel that “I’ve got it” and other days… I wonder. It’s a dance and every new experience has its own rhythm. Being here has also given me a profound new understanding of the complexities and challenges of being a parent…. up close and personal in a way I have never experienced before. At the age of 42 with no kids, I had no true idea of what it takes to be a parent and the limits that children can stretch you to… even in their innocence. I have a new perspective of my own parents and my own childhood. I am now thinking that parents are miracle workers to do it all… even the basics of clothing, feeding and educating a child. And if there are challenges in the environment, it is now easier for me to understand, while those “challenges” may not be an environment that is best for the child, that the parents are often doing the best they can. And so I continue the syncopation of my gypsy ways currently in family life in Philadelphia. As someone who has spent a lot of my adulthood alone and independent, I appreciate the ways it is stretching and growing me. And that said, I also need and love my time tucked in my bedroom, or at the yoga studio, or strolling through the neighborhood. Last weekend I had a wonderful adventure! A few weeks ago at a neighborhood festival I heard a Samba group play and the drums just made me feel alive! It turns out that they were from a local class taught just a few miles away from where I am staying. Last Sunday I took a leap and joined the class… and I LOVED it! It was so amazing, everyone playing there was filled with such joy, beaming smiles on their faces as they played. As I became more familiar with my drum and my role, I let go of my concentrated effort and allowed my own beaming smile to join in with theirs… moving and grooving as we played collectively. It was fabulous! The teacher was a wonderful leader and I am welcomed back in the future while I am visiting in town. It is so great! I also discovered a BEAUTIFUL park just a few miles from here. The park is called the Wissahickon and my hosts here guided me to a friendly and beautiful walk down a road in the park called Forbidden Road. It was … amazing. The fall leaves are in peak and the road runs along a gurgling river. It was truly one of most beautiful parks I have ever been too. 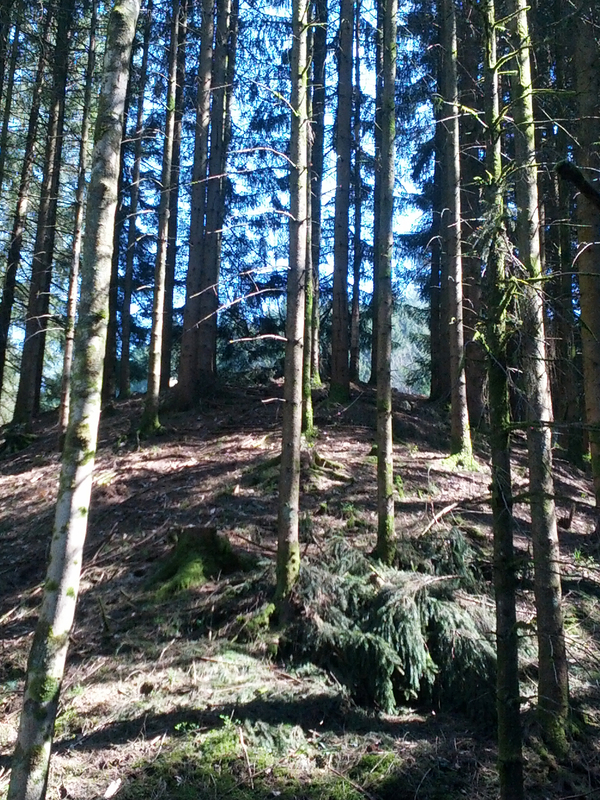 The magesty of the surrounding trees just took me in and brought me home to that place where I feel nurtured. The adventures continue, it’s fun, it’s beauty, complexity and simplicity… . Life with a family… its blessings and its challenges. I suppose its all just a part of learning to be…at home. Photo just a little slice of Fall! Well, it happened. I left Wettenbostel. I know it is true because… I am in France! I am doing a new help exchange and have connected with a small bed and breakfast in Burgundy area of France through the website helpx.net. There was a time I thought I might not leave Wettenbostel. Like somehow it was my cosmic fate to be forever entwined amongst its potato fields. Even a week before I was scheduled to leave for France… I was not still totally confident it would happen. But here I am. I have left. And so it seems to cosmos has opened the gate to what is next. 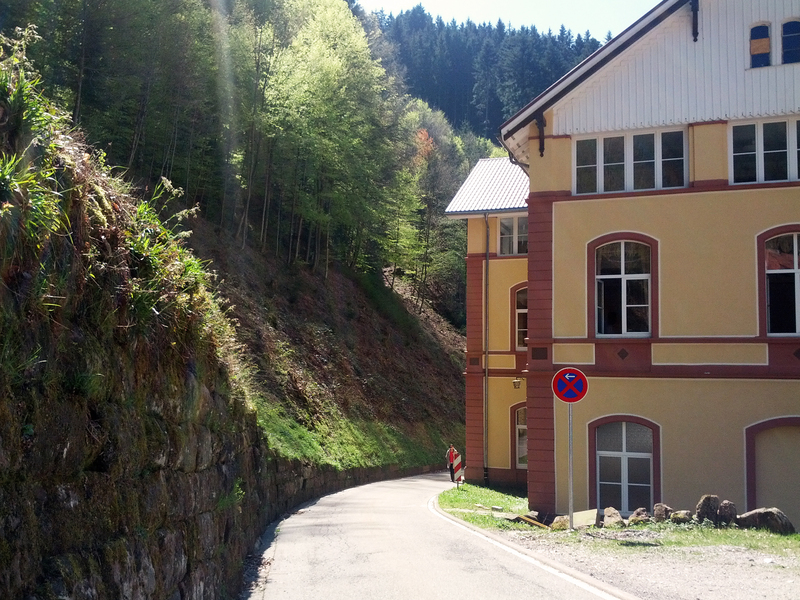 The last few days in Wettenobstel were full and hearty for me. We had a seminar all weekend filled with the usual demands… mostly assisting with preparing meals and cleaning up after. In typical fashion these work weekends stretched me to my max demanding that I take a closer look at myself… is there something more than I can do? Can I look at this another way? It also continued to challenge me in the space of living and working in community and the balance of caring and honoring myself in the midst of much work to be done. Still a wobbly act and a skill that I have not quite mastered. But alas, I continue to grow. The last evening in Wettenbostel was spent in typical Seminar Haus fashion. The hot tub was filled up and we were joined for the evening by regular faces of the Seminar Haus tribe. We gathered from around 5pm into the evening, hanging out in the hot tub, sharing a farewell toast, and giving and receiving words of thanks and completion. My departure was not a solo act as my new Candadian friends too have left. In a way it was a relief to me to share the departure spotlight with them. It was a joy to experience a little grace in the evening, sharing time with my hosts, the Canadians, my friend Dan from the States and other guests, until at last there was no more…and it was time to leave. I am leaving a place that has been so colorful and lush decorating the landscape of my life. And yet it is clear that nearly a year to the date that I arrived, it is time for a new scene. Traveling on the train to France, as I switched trains in Southern Germany to the French train it was like entering another world. I suddenly felt ill equipped not knowing which standard greeting to use… as I was still in Germany but on a French train. Do I say “hallo”… or now “bonjour”? The familiar business-like feeling of the German Deutsche Bahn was replaced by a sleek silver French train with plush lavender interior. As we arrived at each stop slowly getting closer to France I felt butterflies arise in my stomach. It is one thing to leave New Orleans and go spend a year in Germany. And its another thing to make plans to leave Germany and say you are going to France. But it is still yet another thing to actually GO to France. And so here I am, I have arrived. I am quietly settling into my new digs… diving into some of the familiarity of my small traveling world. Unpacking my suitcase. Finding my toothbrush. I have a simple but comfortable private room in the downstairs floor of the private quarters of the Bed and Breakfast. I am surrounded by the gentle and friendly company of the owner and his visiting mother. So far there is an easy laid back attitude here inviting me to… relax a little bit. Maybe even exhale. Yes it is true… I am in France. Photo from the flowering gardens of the Seminar Haus, Wettenbostel. It is a rainy day in Wettenbostel. It is Monday after a busy Seminar Weekend. The weekend felt intense and I am grateful for a rainy Monday… allowing a little quiet and rest to drift in. It seems lately there is always something happening here at the Seminar Haus. A party happening nearly every night and the energy of change in the air as the Seminar Haus prepares to close its doors in August and considers what is next. I am still accompanied in Wettenbostel by Dan, the American Reiki Master, and the young couple from Canada. The Canadians have been here for the past month or so to visit, live and do work exchange. While Spring is blossoming in the garden… it is coming hesitantly with the last few days filled with cold breezes demanding the returns of jackets and scarves. I continue to do my work here… my outer work… cleaning rooms, chopping vegetables, assisting in the kitchen. And my inner work of learning to pay attention and be present. This weekend I got to make humus for the guests… a bit of a treat to be allowed that flexibility in the kitchen. I also chopped up dozens of vegetables and mixed up a good salad or two. Finding a joy in putting the green olives decoratively on the top of the salad then season and speckling the top with pepper. Looks good and well, tastes good too. Appreciating the pleasure of mixing the salad with oils, vinegar and seasonings feeling and seeing all of the ingredients come together. And experiencing at least a degree of satisfaction of being pretty well prepared in the kitchen after nearly a year of working here. It feels good to… mostly.. know what to do… For example… at the Seminar Haus kitchen… when you cut and chop the onions, a standard at most meals, you saute them in a little oil and always add plenty of garlic! Then add herbs while sautéing and when it is nearly done… melt in some butter. My host says it provides a better flavor and texture when you add butter. Then the onions will be added to… something! Often soup, or a sauce, or some other vegetable combination that has been prepared. I had a new experience this weekend in my life of trade in Wettenbostel. I got to mow the lawn! It was a riding mower and the lawn is quite big nestled with windy paths in the garden. My host encouraged me that I was doing a good job and I somewhat hesitantly lead the big machine around the yard. Kind of a kick to find myself out mowing the lawn while the men of Wettenbostel were in the kitchen cooking. It’s been fun having the “young” Canadian couple around. They have a young fresh attitude and add an ample additional set of helping hands which makes the work around here feel… possible. They will be leaving soon to head to their next adventure… teaching English in Thailand. They leave sometime next week… the latest turn in their adventure of life and travel! And me, well for today, I am going to do my best to enjoy some rest in the wake of the latest seminar and accompanying partying here at Wettenbostel. In the quietness of my meditations I continue to hear an inner whisper… “I am learning a new way”… Sometimes feeling overwhelmed in all the twisting energy here and life and change… I wonder what is this new way I am learning. But then I hear and I see and I am clear. It’s the lesson of my namesake… St. Teresa the Little Flower. Teresa is recognized as a Saint in the Catholic church and was a mystic in her own right. She dedicated her life to serving God. She is known for her attention to the little things… serving in the little ways. She is quoted as saying “What matters in life is not great deeds, but great love.” So I see in my journey I am learning my way in the little things of life. And learning to be of service in the little ways. One day at a time. It is requiring of me patience, humility, learning to pay attention and learning to show up to myself and to my life. Inner work. Outer work. And little ways. It’s just another day in Wettenbostel. Photo from the gardens of the Seminar Haus Wettenbostel. I have been here at Wettenbostel for almost a year now. What an opportunity and challenge it has been! This year has been packed full with new experiences and people. The foundation of my “existence” here is my agreement with my hosts to do work exchange. This idea is simple… I work a certain number of hours a day in exchange for room and board. It’s a brilliant idea and opens up a world of opportunity. My host here in Wettenbostel is very generous about opening his doors to people willing to lend a hand with the work. He has recently become a member of the website helpx.net, a resource that connects travelers with hosts offering room and board in exchange for work they may need at their home, farm, business. We currently have two visitors through helpx from Canada visiting here for a month… or longer as things may go. Living this past year in exchange for room and board at the Seminar Haus has been interesting and challenging. Here in Wettenbostel we are asked to work three to four hours a day… but the truth and experience of that is we are part of a “community” here and asked to contribute to what needs to be done on any given day. Some days before seminars we can get very busy and rushed and it isn’t unusual to work 8 or ten-hour days. Generally speaking we do not have days off here, although sometimes after a seminar we will take the next day a bit more slowly. This past year has been a bit of a dance with me and my host finding the jobs that I do well and in a way that is pleasing to him. I have had to learn to be flexible, try new things, fail, try again and communicate. It relies not just on the physical work, but also maintaining the relationship with my hosts along the way. The work I find I mostly do here at the seminar haus is cleaning the rooms before and after seminars. We have 15 sleeping rooms total in all three buildings on the premises. During seminar weekends I often spend a lot of time in the kitchen. We serve three meals a day and I have helped with breakfast, lunch and dinner… sometimes helping to prep the food and often cleaning up afterwards. I have done other miscellaneous jobs over the year. I have painted the ceiling in the big dojo, pulled weeds and dug edges in the garden, assisted with cleaning and organizing the home of my host, and I have given Reiki treatments. Through it all I have learned many lessons. I have learned to have more patience, with myself and others. I have learned to be more flexible as the spirit of this place and my hosts is unpredictable. I have learned to take more initiative… that is considering what needs to be done or what could be done or asking what should be done in the course of the day when things may be slow. And I have learned, and continue to learn, what it means to give of myself to others and asking myself… what is it I have to give today. I have learned to continue to work in the face of my own challenges or resistance to the work at hand and I have explored setting boundaries for myself that still gives me time and space to take care of myself and meet my own needs in balance with what needs to be done and what is happening in my environment. Like I said, this time of doing trade has been a dance… I am not sure what kind of dance exactly it is… but ultimately I feel it is good and nourishing for me. It has taken me down new roads and paths, and it has pushed and challenged me mentally, emotionally and physically. And after a year, I feel I am just beginning to find my feet in this new way. There are places where I feel I have faltered and places where I feel I have grown. Wow, what a time it has been! And will continue to be… learning to live life in a new way. Photo from the gardens of the Seminar Haus in Wettenbostel. Another day in Wettenbostel! The cool not yet spring air of April is invigorating as I find my way back to the little room where lately I have called my home. I just finished eating a little dinner and enjoying the company of our visiting Canadians. During dinner we were doused and periodically entertained by the injected energy of our host, Michael. We are now complete with four residents here at the Seminar Haus with the return of Dan, porch companion, Reiki Master from Oregon and long-time resident here in Wettenbostel. It is Friday the 13th and I wonder if that accounts for some of the strangeness of the day. There is a new dynamic and energy here in Wettenbostel with our shifted collection of folks and my hosts returning from their week-long escape to Austria. I’m noticing new ebbs and flows which sometimes have me feeling a little dizzy and sometimes feeling a little lost or left out in the cold. Our new visiting Canadians are a young couple who have been traveling around Europe since September of 2011. They found their way to the Seminar Haus through the on-line web-site helpx.net, a resource for work exchange for travelers. They arrived at the Seminar Haus in the midst of kitchen chaos during the week-long Aikido workshop. They seem to be doing a good job so far of riding the Wettenbostel wave… where you never know what will happen next. Both are friendly, with big hearts and loving kindness. The sun is starting to set on this Friday the 13th and I have to say I am glad for this day to wean away. It has been filled with a mixture of emotions that I am ready to tuck into bed into the comfort of a good night sleep. All is well in the land of Wettenbostel. Things are shifting on the inside and out. Somethings are clear. Some things are uncertain. And a new cast of characters assembled for now… falling asleep underneath the Wettenbostel moon on this night, Friday the 13th. Photo by me, gypsy woman, from the budding gardens of Wettenbostel. It is a chilly day in Wettenbostel. The day before Easter. I woke up this morning to see white flakes flying through the air. My first thought was… perhaps they are blossoms coming from a tree… it’s Spring, right? But alas, the weather today has been below freezing and those white flakes were snow. The day has been a strange culmination of sunny blue cold skies and unexpected flakey white showers. I recently finished a week-long Aikido workshop here in Wettenbostel. It was led by Reiki Master and the Head of Discipline in the Usui Shiki Ryoho tradition, Paul David Mitchell. I am left in its wake feeling like I just took a magic carpet ride! This workshop was not your typical Aikido workshop, but a poetic journey of exploring Aikido practices and principles. Paul calls the workshop ” The Way to Harmony” and we were lead home to ourselves, to each other and to a power greater than ourselves. Paul has been teaching Aikido workshops in Wettenbostel and other places in the world for over twenty years. Paul Mitchell is a gentle, thoughtful, attentive, powerful and kind teacher. I was the “new kid on the block” in an assembly of around 16 returning and dedicated students. I was welcomed into the group with open arms and challenged to be present and rise to the experience. The workshop began with an introduction to the Aikido concept “one point”. One point physically is located in the pelvic area. If you hold your thumb to your belly button and extend your hand to your pinky, it reaches your one point. Being in “one point” gives one access to a soft gentle power that to me felt like coming home. The first few times I experienced being in “one point” it almost brought tears to my eyes, being so relaxed and at ease yet being strong and unmovable. In that space of grace and ease there is an undeniable power that is greater than any physical force, resistance or effort. Learning to connect to one point for me was like beginning to meet an unmet need. We were partnered up and began a series of tests to learn and explore being in one point. We began with holding our bodies in a state of resistance. Holding tightly, we used force to hold our bodies still and with some effort our partners were not able to move us from our stand. Then we explored holding our bodies in non-resistance… that is we allowed their hand to move us as we gently fell backwards. Then, one point. Standing in a space of non-resistance we focused our attention on our one point. And when tested… we didn’t move. But not only did we not move, unlike with physical resistance, our mind-body and spirit were in a space of openness and relaxation. Paul referred to being in one-point as our natural state, which he called mind-body unified. The creator of Aikido, Morihei Ueshiba, calls this the perfect state of balance with the spiritual and the physical self. We were guided to access mind-body unified in other ways as well. We explored the principle of weight underside. To understand and experience this concept we were asked to stand next to our partners and put our attention on the bottom of our feet and let that feeling of attention flow through our whole body. When doing this, guess what?… again unmovable. To test this our partner put their hand on our ankle and tried to lift us. When in a state of resistance we would eventually go toppling over with some strain. But with attention to weight underside, again unmovable and ease and grace in the body and mind. As we continued to explore these concepts in the workshop I began to see that certain things can take you out of the state of mind-body unified. If I was worried, or thought to much or let me emotions take the lead I was unable to maintain the soft ease of mind-body unified. I noticed this and practiced returning to the space of mind-body unified in the midst it. I was coached by Paul to let my emotions go to my one point and with some practice I was able to find my “center” again using these techniques. To demonstrate these ideas, Paul had us do an exercise where we went to one point and whispered to ourselves… I can’t do it. And notice the results… which were, of course… not being able to stay in the soft power of one point. Then we whispered “Maybe I can do it”… and similar results. And then we said “I can do it”… and with that positive intention there was success. The workshop invited us to explore our relationships and connection with one another. With some practice, we progressed to some more challenging exercises. One of these exercises used wooden swords. We learned a pattern with the swords, dancing over and around our shoulders, that at first we did separately. But then, we came together and worked with that pattern in relationship to a partner. We stood, legs stretched out, connecting first one point for ourselves and then connecting in mind and heart with our partners. And then we began. As we did our individual patterns together, our swords connected with our partner intermingling in a beautiful and powerful pattern. During this exercise, I learned a little bit more about the importance and possibility of trust. First I had to trust myself… with my own power and my ability to do my part. Second I had to trust my partner to do their part. I saw that if I didn’t trust my partner, I would hold back… trying not the “hurt them” which limited the connection and the experience. But if I trusted myself and let go and trusted my partner, the exercise was a satisfying experience of play and connection. In the workshop I saw that I am not a victim… I have equal access to the “inalienable right” of soft power of mind-body unified. I got to experience that even when challenging feelings or emotions came up, there is still the possibility of reconnecting with this strength. And now, the week has come to a close. New faces and connections from the workshop have come and gone. And time continues here in Wettenbostel. We have received the gift of a young traveling Canadian couple here to work and visit for a little while. Their smiles and spirits very welcome here. My friend Olaf from Hamburg unexpectedly arrived in Wettenbostel as well so on “Easter eve” we have a small community here. There is an easter bonfire in Wettenbostel tonight. It is promised to bring out most of the 59 residents of this small farming village. The cold weather may be a little daunting, but I intend to make my way to the community event. But for now, I enjoy a little quiet time in the intimacy of my room looking out the window at the expanding woods outside. Bathing in the aftermath of the Aikido workshop and the experience of my own strength and soft power. Photo by Michael Hartley from the emerging… Spring?… gardens of Wettenbostel.